AS a youngster, I use to marvel at Tarzan's ability to swing through the trees on conveniently placed vines and envied him thinking how much fun that would be. Now a few years older, I found you can experience the same exhilaration in the jungle forests of Thailand. Zip lining adventure parks are the 'next big thing' in eco-based tourist experiences and they cater for all ages and physical abilities. 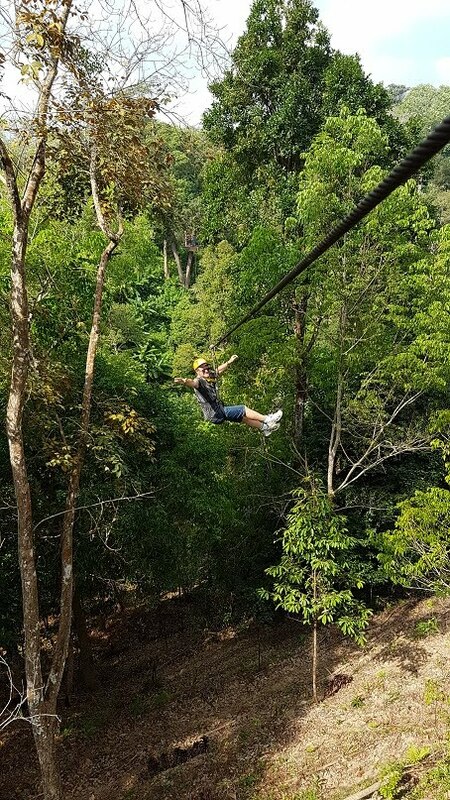 The adventure parks are a great way of appreciating the countryside while providing the thrill of flying through the tree canopy suspended from a large wire cable. For someone like myself who has a fear of natural heights, it was also a way to overcome that, being focused on the instructions provided by the guides. 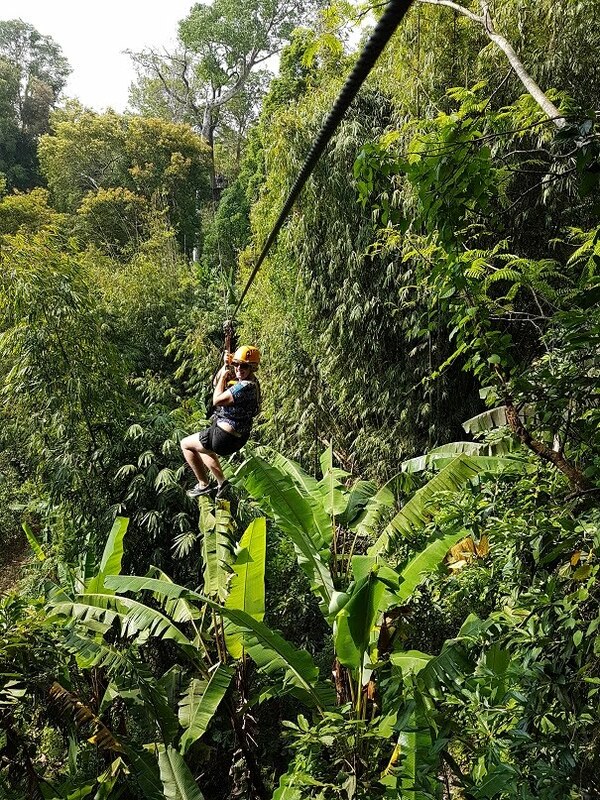 On the island of Phuket, there are several different zip line parks, located around the island and each offering various levels of physical intensity. Holidays tend to be a time when you push yourself or try something different and having been on numerous boat tours, ATV rides, go karts and other day trips, a day hanging from wires and flying through the trees sounded appealing. There are numerous parks offering different packages involving courses offering a number of 'platforms' – from 18 up to 32 with some park offering as many as 40. Prior to embarking on the course, you are weighed (very important); the guides fit you up with a suitable size and strength harness and a helmet. It's off the course in the back of a troop carrier jeep and once at the starting platform, our guide gave a through but very entertaining run down of dos and don'ts while on the course. Safety is the key to these parks and while our guide 'Tony' joked about losing people "yesterday", he and his assistant keep a constant eye upon our group of eight. We three Aussies, my wife Paula and our friend Alan were the oldest in the group but also the most eager. The starting platform isn't that high off the ground and the spiral staircase around the tree wasn't too physically challenging. The first zip is only short to get us ready for what is to come but it also had us hungry for more. You must place your trust in the guides who do all the unhitching from the safety cables leading to each platform and connecting to the zip line and once across reversing the process , hooking you back to a safety cable while waiting for the other member of the group to cross. 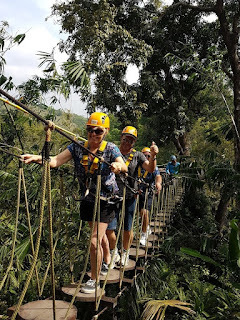 Not all platforms involve zip lines - there are suspension bridges, net bridges, spiral stairs, sky bridges, a flying skateboard for two, a superman prone zip line (if you want to really fly) and abseiling sites. You also can place your faith in the guides and their photographic abilities by giving them your phones to capture you in action – highly recommended rather than paying for onsite photographers. Looking back on the video on your phone and hearing the yells from the guides as you fly across gullies and between gaps in the trees provides great memories. 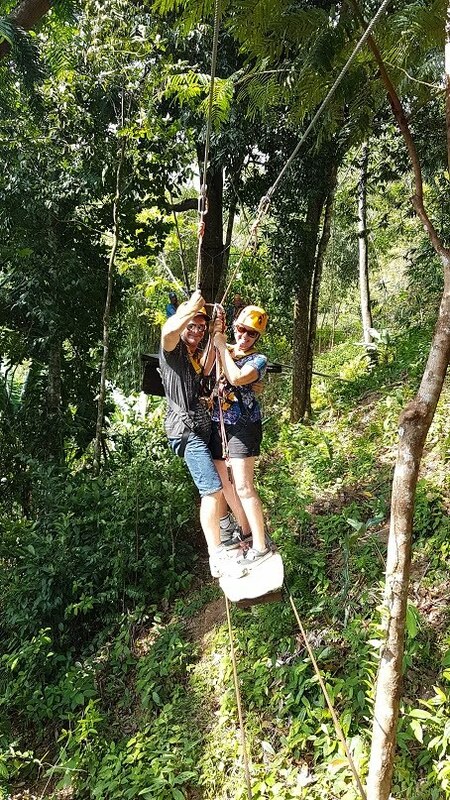 The courses are designed to take advantage of the natural; landscapes with some of longest zip lines in Phuket stretching across 500m valleys. One thing is certain - at the completion of the course, your blood is pumping, it is very addictive and you feel like going again. Most parks offer free hotel pick-up and packages can also include lunch with most offering water, tea or coffee. Don't be fooled into thinking it is an activity for young people - we are all over 50 and in reasonable shape and couldn't wait for the next platform on the course. 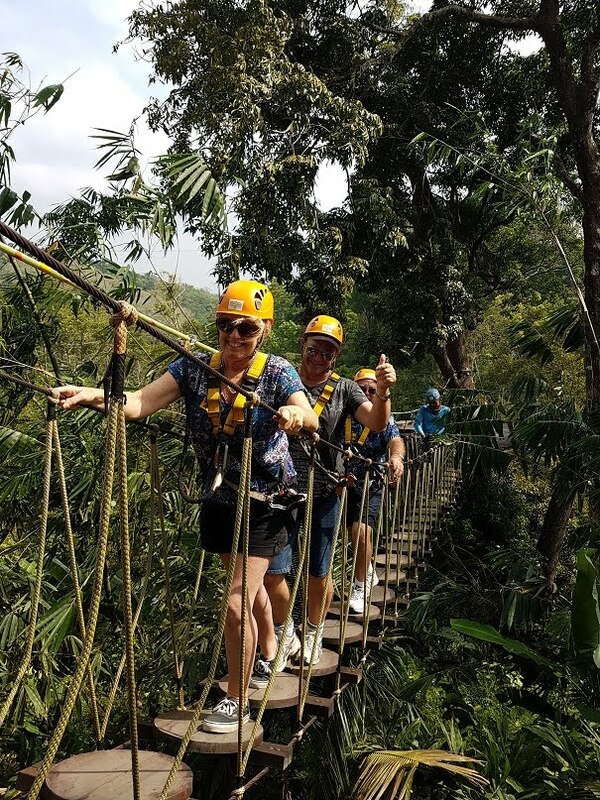 You don't have to wait to go to Thailand to experience this form of excitement, there are plenty in Australia but if you do find yourself in Phuket and looking for an adventure, just head for the trees, you never know who you might see zipping about! For more information, www.phuketatvtour.net or contact your local travel agents. 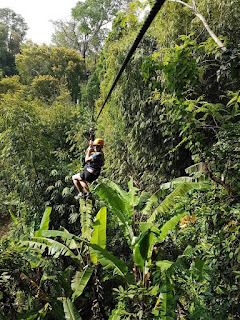 Zip line 3 – Get a different view of the world from a zip line. Zip line 2 – Adventure parks have offer challenges like sky bridges to negotiate on the way between the various zip line platforms. Zip line 4 – Aerial skateboards will test your balance. 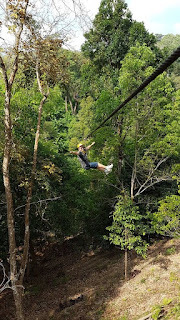 Zip line 5 – There's no time to be afraid of heights when on a zip line high above the jungle. 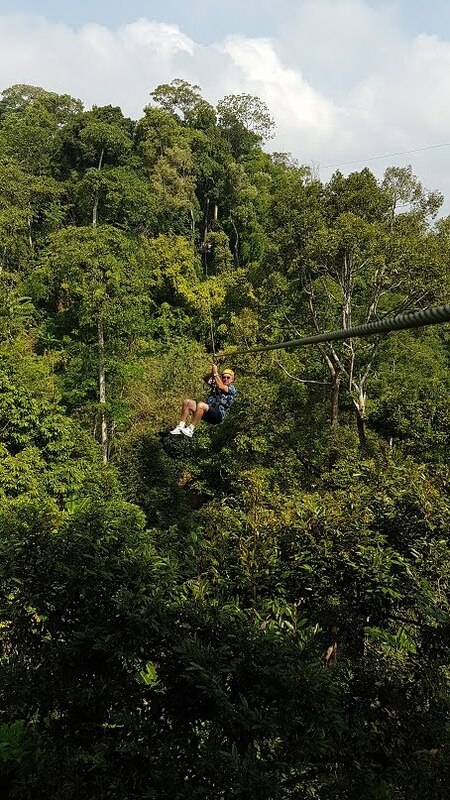 Zip line 6 – Various platforms nestled in the trees are the arrival and departure points for zip lines in the adventure parks and allow you to get a great view of the countryside.